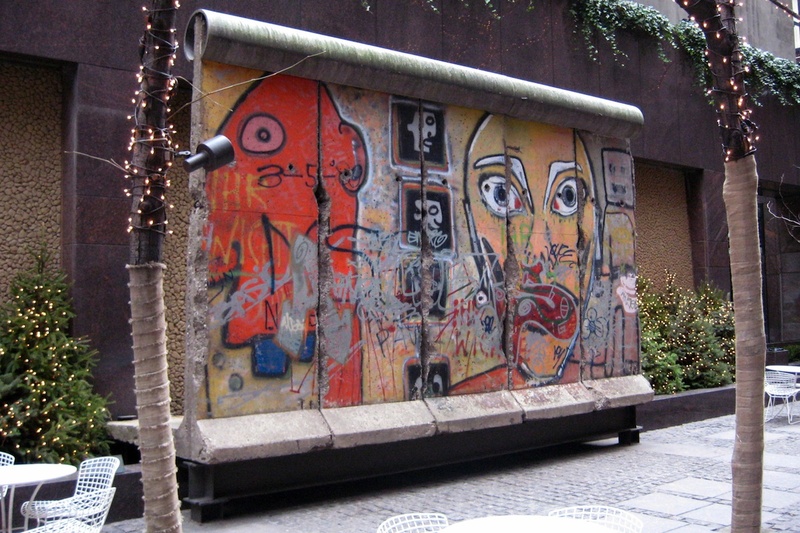 These five segments of the Berlin Wall, which separated East Germany from West Germany from 1961 to 1989, stand in Urban Plaza outside 520 Madison Avenue. Beginning in 1984, Thierry Noir, Kiddy Citny, and others, would illegally sneak in and paint parts of the wall to bring artistic life to such an antifreedom symbol. Inscribed with garish, colored images of grim faces and graffiti the slabs convey the sense of desolation and alientation felt by those divided by the wall. After the wall came down, others took possession of these muraled pieces and auctioned them off in Monaco.